Observation - Small Unknown Bird - ?? Snow Bunting - UK and Ireland. 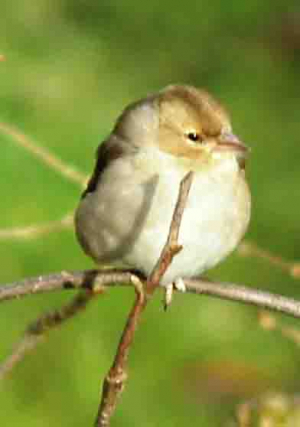 Description: Small, Robin-sized: finch-like beak; creamy white breast; buff-brown head with darker stripe over crown; darker sides; pinkish white feet. Did not see back, tail or wings. Small, Robin-sized: finch-like beak; creamy white breast; buff-brown head with darker stripe over crown; darker sides; pinkish white feet. Did not see back, tail or wings.